Designed for superior cutting accuracy, this paper trimmer features a laser cutting guide that shows exactly where to line up the paper for a precise cut every time. The laser has and on/off indicator and an easily accessible adjustment dial. 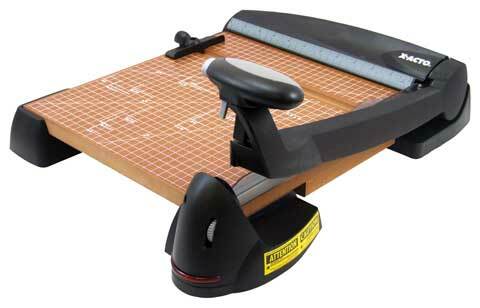 The heavy-duty wood cutting base, hardened steel blade and X-Acto perpetual edge shelf sharpening system provide for long-lasting use. The trimmer also includes a spring-loaded finger guard and paper holder for maximum paper usage and safety. It will cut up to 12 sheets of paper.